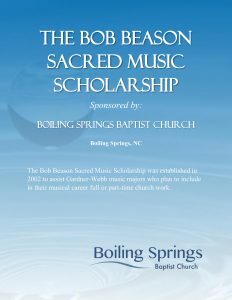 The Bob Beason Sacred Music Scholarship was started in 2002 and is awarded each year by the Music Committee of Boiling Springs Baptist Church in memory of dedicated choir member and church member, Bob Beason. Recipients are music majors at Gardner-Webb University who plan to be in full time or part-time church work. Listed below are the most recent winners.